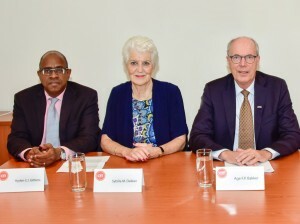 THE BOTTOM - During its visit the Board of financial supervision Bonaire, Sint Eustatius and Saba (Cft) concluded that Saba still has its public finances in good order. Although the budget execution in 2016 did not go entirely according to plan, Saba managed to maintain its budget balanced. The financial setbacks during 2016 have been processed adequately in the budget, which is also characteristic of good financial management. This was reflected as well in the unqualified audit opinion, which was obtained for the second consecutive year. "Saba has proven once again that it has its affairs well in order," said Cft President Age Bakker. The year 2015 ended with a positive result that is sufficiently high to accommodate repayments. This is reflected in the 2015 financial statements, which for the second year in a row received an unqualified audit opinion from the auditor. The execution report of the third quarter of 2016 showed a positive balance, but this balance is not sufficient at year-end 2016 to meet the repayment commitments of the public entity. Particularly as a result of a new collective agreement and several setbacks, the costs were higher during 2016 than initially budgeted. The calculated positive balance remaining by year end will therefore not be sufficient to meet the projected repayment obligations. It is expected that Saba will have to use its cash flow resources to comply with its obligations. During the visit of the Board on December 14, the Executive Council and the Island Council discussed the financial situation of the public entity and the financial setbacks of 2016. According to the Cft a sensible solution was found in lowering the annual repayments, resulting in a longer repayment period. The fiscal space thus created in 2017 and 2018 will be needed to address rising personnel and maintenance costs. The additional expenses in 2016 will cause a drop in the liquidity position. The Cft shares the concern of Saba that the budget is too tight to structurally absorb similar setbacks. At the end of the visit attention was paid to the financial management as well. For the second consecutive year an unqualified opinion was obtained for the financial statements. The Cft therefore concludes that the quality of the financial management is sufficient and that Saba should keep up this level. One aspect that needs special attention is the fact that the submittal of the compulsory reports to the Cft is sometimes delayed.